the Greek scientists and philosophers believed that nature only counted four elements; earth, water, fire and air. The atoms were believed to be the building blocks of these four elements of the universe. Aristotle added the fifth element aether and said that planets and stars were made of this aether. Greek philosopher Plato, described these five elements and added that matter is created from the five Platonic solids that he described in his book Timaeus. He connected the tetrahedron with the element fire, the cube with the earth, the icosahedron with water, the octahedron with air and the dodecahedron with the aether, the stuff of the planets and stars. You will say there are far more elements in nature than the ones known in Greek antiquity. However, it is a well-known fact that the Platonic solids play a role in chemistry as the internal organization structures of molecules in many materials. For instance the Platonic solids show up in the organization of molecules of natural crystals, and they will have to look at the alchemical discoveries made with gold etc. through the articles you will discover a different knowledge about matter that agrees with Plato that the atoms are constructed from the Platonic solids. Some scientists now believe that the aether is a subtle energy that flows through all material things like some liquid, creating the material world from it. The Platonic solids are believed to be the geometrical internal structures of the atom. That’s the reason why sacred geometry is so important in relation to aether . It was the medium through which the electromagnetic wave was supposed to propagate. In those days physicists believed that matter and the aether were two separate things. The aether served as the carrier medium for radiant energies such as light and was believed to transmit force fields between material objects in the universe such as gravity. James Clerk Maxwell, the founder of electrodynamics and his contemporaries didn’t have any doubt that the aether existed. However in 1887 Albert Michaelson and Edward Morley conducted an experiment to prove the existence of the aether. At the time light was thought to be a compression wave that propagated as a longitudinal wave through the motionless and stationary aether, just like sound waves through the air. While the Earth itself is spinning, the Earth must have a relative motion with respect to the motionless aether. They reasoned that when the speed of light is measured on the surface of the Earth, it should give different results when measured clockwise or counter clockwise with respect to the rotation of the Earth around its axis. However the Michelson Morley experiment proved that the speed of light had the same constant value no matter in what direction the speed of light was measured. From this experiment it was concluded that the aether did not exist. Physics has abandoned the aether theory ever since. However today scientists believe that the results of the Michaelson-Morley experiment have been misinterpreted. now ponder on this while you visualize the star of Bethlehem spinning and then look at the picture of a black hole shown in a previous article. 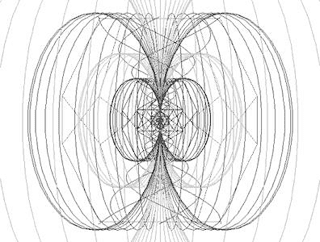 now after a hundred years the aether is back in physics. In the new emerging physics, the Newtonian particles and quantum mechanical particle/wave duality is abandoned. In new aether physics there are only waves! The aether is the medium of the electromagnetic waves and it is assumed that the aether is a non-material fluid-like medium, a subtle energy substance that permeates the entire universe. It is a known fact that waves require a medium to wave in: without a medium, there can be no waves. Sound requires the air. For water waves it is the water that waves. But for some unexplainable reason ever since the Michaelson-Morley experiment supposedly disproved the existence of the aether, physics accepted the fact that electromagnetic waves can travel through empty space without any medium at all, if there is no medium, then what is waving? How is light to behave as a wave phenomenon if there is nothing to wave in? Physics accepted that light could travel through absolute nothingness only because the Michaelson-Morley experiment had failed to prove the existence of the aether. In this new aether physics there is no dualism, no distinction between a material and immaterial thing; it is all energy since energy is all there is! Matter is not a fundamental property of the universe; it is the form not the substance that shapes matter. Now you can take Einstein’s famous formula E=m * c², one step further and really start to understand what this formula implied! It is not that energy and matter can be interchanged; no, matter = energy! Therefore matter is an illusion of solidness and separateness. Eastern spiritual traditions have always claimed that the world is Maya, illusion. What they meant by this is that separateness does not exist; there is only the unity at the fundamental level of existence, the unity of Brahman. You will come to see that Eastern wisdom corroborates by modern day science! the universe is multi dimensional and is made of one substance and one substance only! This substance is called aether and it is a vibrating fluid-like energy that permeates the physical vacuum. Matter as you know it is created moment by moment as a standing wave, a vortex in the physical vacuum. It is the condensed center of these vortexes that creates the illusion of a separate particle. All matter in the universe is interconnected. The WSM theory is relatively simple. It proposes that matter is the focal point of a standing wave the result of two interfering waves. One is an inward wave moving towards the center and the other is an outward-bound wave moving away from the center. The waves are spherical waves in the fabric of space. The center of the two spherical waves is the ‘point particle’ center. As simple as the axiom of this theory is, the properties these standing waves can assume seem to be immense. here again consider the thorus and two spherical waves interacting. If he is right the origin of the physical laws and the properties of charge, mass and gravity, for the first time can be understood. Mainstream physics could never really explain these; for one thing we still don’t know what gravity really is; we have known the physical laws of gravity since Newton; however we don’t know what’s causing gravity! But they will need the keys and math you have been reading about on www.truth-revelations.com. Paul La Violette has developed a general system aether theory called subquantum kinetics. He believes that science is wrong about many aspects in physics including the Big Bang theory that tells us that the universe came into existence from one big cosmic explosion. According to the Big Bang theory, the universe inflated from what is called a singularity, an infinitely compressed point in space, into a volume of several hundred million light-years in diameter in just 10?³² seconds! This event required that all known laws in physics, including the laws of thermodynamics, Einstein’s relativity laws (nothing can exceed the speed of light) were disabled for the happy occasion, the birth of all matter and energy from complete nothingness. After this briefest of moment of time, the holy laws of science were re-enacted and ever since the universe does not allow energy and matter to be created from the same nothingness any longer (first law of Thermodynamics). At its birth, the universe showed its highest degree of organization and physics dictates that this order eventually will decay into complete chaos again (second law of thermodynamics). Scientists call this the increase of entropy. Paul La Violette does not contradict these laws; on the contrary, he simply doesn’t believe that these laws were disabled for just this split second during the Big Bang. In his book ‘Genesis of the Cosmos’ he mentions many more problems with the Big Bang theory such as the explanation for the observed red-shifts of stars that cosmologists use as proof that our universe has been expanding ever since the Big Bang. The red-shift of the stars is believed to be caused by the Doppler effect as stars move away from our point of reference. Cosmologists never took the alternative tired light explanation for these red-shifts seriously- that is, the fact that light traveling over billions of light years may be absorbed by intergalactic material resulting in a loss of energy and an increase of wavelength. The aether is supposedly an unobservable metaphysical realm, a non-equilibrium transmutable medium that continuously fluctuates. When fluctuations reach a critical threshold they are able to spawn stable waveforms in our observable physical universe. It was only in 1973 that system theorists learned about chemical solutions that were able to create self-organizing chemical reactions that spontaneously started to oscillate. These chemical reactions such as the Belousov-Zhabotinski reaction periodically spawned so-called chemical or reaction-diffusion waves. The cross chemical reactions involved oscillate between low and high concentrations of the chemical compounds that drive the reaction. Let’s assume that the first reaction uses compound X to create compound Y, then the second reaction will be exactly the inverse of the first and use compound Y to create compound X again. There is a constant diffusion of the compounds from areas of high to low concentrations, hence the reaction-diffusion wave. These chemical waves will spawn beautiful Mandala like wave patterns when put on a Petri dish. To understand how the chemical reaction actually starts to oscillate let’s use the metaphor of the predator-prey system. Suppose we have a population of rabbits that has an abundant supply of lettuce. Since rabbits breed rapidly , their population will grow fast. However in our little closed habitat there are also foxes that feed on the rabbits, limiting the growth of the rabbit population. Since the rabbit population grows fast, so does the fox population. However, since there is a feedback loop in our system, balance will be restored in our habitat; when the foxes eat too many rabbits, they will run into a food shortage, reducing the growth of the fox population and allowing the rabbits to survive. The fox-rabbit population will oscillate between two extremes, a minimum and maximum, a perfect example of a wave oscillation. From these observations, Paul La Violette reasoned that the aether may likewise spawn wave patterns from two aether states, two different aetherons, which continuously mutate from one state into the other and visa versa. In normal cases, the aether maintains its equilibrium state due to the second law of thermodynamics, however under critical conditions these aether transmutations like the predator-prey waves may become self-organizing and form stable wave patterns. These wave patterns will become observable in our physical universe as electromagnetic energy, light. His theory has been tested in a simulator model called the Brusselator and uses two X and Y aetheron states to prove that under critical conditions, self-organizing oscillations may spontaneously come into existence. The actual ether reaction used just a few more intermediate ether states but for the sake of simplicity aetherons X and Y are the only ones mentioned here. Sub quantum kinetics yields a better alternative for the required in and out waves of Milo Wolff’s WSM theory. As we progress in our understanding of how matter is actually shaped from the aether, we will see in the next paragraphs that the vibrations created from the aether must be organized in vortex shapes in order to shape the atom. above is a star-tetrahedron; If you examine the picture carefully you may have noticed the two equilateral triangles, one facing up and one facing down. Together they form a symbol that is known as the Jewish Star of David, but remember in 3D reality the two triangles are tetrahedrons, three sided pyramids. 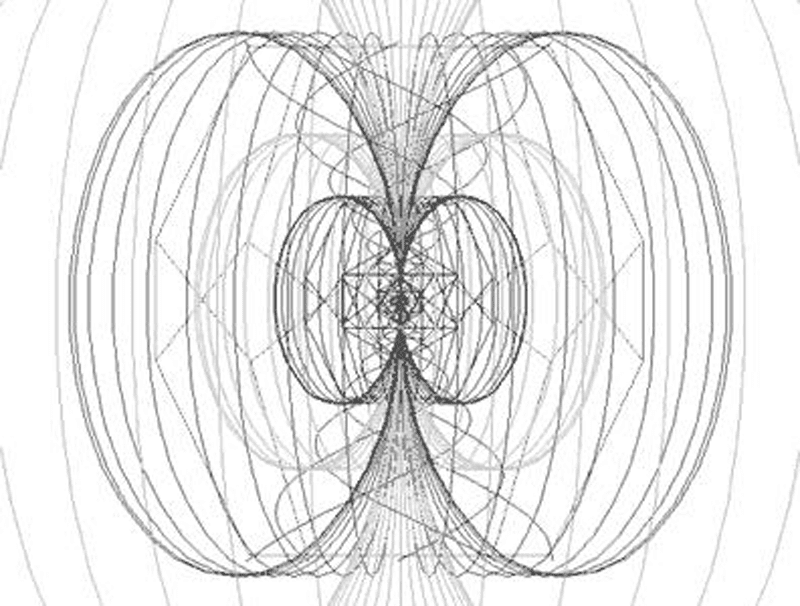 The secret of ‘Sacred geometry’ is not about geometry per se, it’s about vibrations that take on geometrical patterns! torus shape from these observations along with the Platonic Solids to construct the atom. As an example we show the cube that contains 3 vortex pairs or 3 torus doughnuts aligned perpendicular to each other in a cube and 5 nested torus doughnuts in a dodecahedron. When pure sine waves with wavelengths of 1/ ?, 1, ?, ? ², ? ³ etc. are added together, they will form a perfect Phi spiral. The correspondence principle of Hermes Trismegistos ‘as above, so ) below’ is valid also for the Platonic solids in the aura, the energy field of the human body. Science in the nineties has actually corroborated the existence of the bio energy fields of the human body that were already known to the Chinese for thousands of years, know as the Chinese meridian system and the seven chakras in the body. The eastern Chakra systems of the body have been identified as nodes in the human body where vortexes of subtle energy from higher dimensions interfere with the physical body. The energy body in ancient Egypt was called the Merkaba. (Mer=rotating light, Ka=spirit, Ba=human body). It was believed that the spinning light of the Merkaba could take a person from one 9 dimension into another. It was the light through which the soul descended into the human body and that can also be used to ascend to higher planes. times the speed of light. They are caused by many types of events such as the movement of physical objects but also surprisingly enough by conscious thought! Russian discoveries revealed that our thoughts and feelings extend far beyond the body and travel through the universe! ances emotional and physical health What happens is that the frequency components in the spectrum become Golden Mean related (Phi)! Surprisingly also the brainwaves can become entrained, phase locked with the heartbeat waves! Brain and heart waves beat at the same pace and in the same phase connected by the Golden Mean (Phi). heart and mind to our own DNA. Daniel Winter also used his Heart Tuner on a trained yogi who went into a deep state of meditation. Formerly he had instructed the yogi to focus on a tree and to send loving thoughts to the tree. He placed an antenna near the tree and linked both the yogi and the antenna near the tree to his Heart Tuner. Schumann waves. The Schumann waves named after German Professor W.O Schumann were discovered in 1952. The Schumann waves are a result of the Schumann resonance, a frequency resonation of about 8 Hertz that occurs between upper layers in the atmosphere and the Earth’s crust. It is called Gaia’s heartbeat. become coherent with the Schumann resonance of the Earth! This new energy is neither electromagnetic in nature nor does it relate to gravity as it stands on its own. The new form of energy discovered by Kozyrev is a spiraling non-Hertzian electromagnetic wave that travels through the vacuum at super-luminal speeds, a billion times (10? C) faster than light. Due to the spiraling nature of the wave, the wave is called a torsion wave since it traces a spiraling path! According to independent researcher David Wilcock the torsion wave also traces a perfect Phi spiral! Torsion waves are called non-Hertzian waves since they do not obey the classical theory of Hertz and Maxwell. We have already discussed torsion waves in chapter 4 about the zero point field, where we mentioned that Tom Bearden discovered that the fundamental wave in the electromagnetic wave is a scalar wave. The scalar wave is the wave that remains when two opposite electromagnetic waves interfere canceling out the electric and magnetic field components, just like Tesla did. The result is a hitherto unrecognized component in the electromagnetic wave, a longitudinal wave vibrating in the same direction it is traveling. Maxwell’s classical electromagnetic wave theory that is still the prevailing theory today for electromagnetism does not allow for scalar waves and accounts for transverse electromagnetic waves only. These transverse Hertzian waves named after Heinrich Hertz, are created when electric charges oscillate from side to side in a dipole antenna. At a distance they will induce a transverse force on a charge in a distant radio receiver antenna when aligned perpendicular to the propagated direction of the Hertzian wave. Scalar waves, lacking transverse polarity, are generated in a totally different way and cannot be received with a normal dipole antenna, the antenna used in all of our ordinary electronic receivers. This is also the explanation for why this new form of energy has not been discovered much earlier. Tom Bearden’s scalar waves now get support from Paul La Violette whose sub quantum kinetics theory not only predicts the Hertzian transverse waves but also Tesla’s longitudinal scalar waves. According to Paul La Violette a monopole antenna such as a charged sphere will create longitudinal scalar potential waves when periodically charged and discharged. Scalar potential waves can and have been detected using a Bendini detector. Torsion fields can be either static or dynamic. Static torsion fields can take on the form of vortexes like the one mentioned in the implosion physics of Daniel Winter. These static vortex torsion fields in the fabric of the vacuum space can stay in one place for a very long period of time. Kozyrev discovered that torsion fields can also propagate through space as torsion waves at tremendous speeds at least one billion times the speed of light (10? C). Another violation of the laws of Newton with respect to torsion fields comes from Bruce De Palma. He conducted experiments where he catapulted two identical steel balls at the same speed under the same angle into the air. The only difference between the balls was that one of the balls was rotating at 27000 revolutions/minute and the other was not. The spinning ball reached far higher into the air than the non-spinning ball. By the spinning of the ball torsion fields were created that caused a slight change in the total mass of the ball. postulated that these torsion waves were generated due to the spinning of the stars. From his astronomical observations of stars using dedicated telescopes to measure the torsion wave radiation, he noticed that the star radiated this torsion wave energy from a location in the sky that must be the true position of the star whereas the visible light of the star reveals the position of the star many years ago since it took many light-years before this light reached the Earth. From this observation he concluded that the torsion wave must travel at super-luminal speeds. He even noticed that torsion wave radiation was received in a location in the sky that revealed the future position of the star! Since torsion waves travel at super-luminal speeds, they can cross the time barrier and ‘move’ into the future. It accumulates ‘infinite’ energy due to the implosion of the waves into smaller and smaller wavelengths. The shorter the wavelength the more energy is contained in the spiraling wave. Like the tornado accumulates energy and focuses it into the eye of the tornado, the electromagnetic vortex accumulates energy into its still-point. Notice that it is the extreme spinning of air molecules in the eye of a tornado that gives it its immense destructive power. There is little known in Western science about torsion fields created by matter spun at high speeds. NASA has just recently launched a satellite in April 2004 to investigate the spin fields of the planets in our Solar System. Since most scientists believe that the spin field is a property of matter, they fail to recognize that it is the torsion field that creates matter in the first place. Bruce de Palma’s spinning gyro experiments proved that gyroscopes actually lose weight. This phenomenon is totally unexplainable within the current scientific paradigm, however if we understand that by spinning an object we change the overall electromagnetic spin stored in the object, we may see why it has a feeble but measurable affect on its mass. Static torsion fields in the form of vortexes in the aether and the spiraling torsion wave traveling at super-luminal speeds are getting more and more attention in Western science. According to some, torsion waves are the missing link in the search for a final ‘theory of everything’, Einstein’s unified field theory. It seems that electromagnetism, gravity and torsion waves are all members of the same family; they are just different forms of aether vibrations. Torsion waves may be the physics for telepathy, the ability of mind reading between two individuals. Since torsion wave can physically affect matter, it may also be the explanation for psychokinesis or PK, the ability to mentally change physical objects. Stage performer and spoon bender Uri Geller has always demonstrated these abilities in front of large audiences. Although many still think he was a conman, he has been experimented a lot with psychics because they believed that their abilities were genuine. The memory effect of water may be a physical explanation for homeopathy. Many people are very skeptical about homeopathy because how can clear water that has been diluted so many times such that all chemical compounds are gone still have a medical effect? Pure water can’t have a healing effect can it? However the invisible torsion fields that are present in the water may be the reasonable explanation for this phenomenon. Sound Energy Research sells their programmed ‘smart’ water in bottles in three different flavors. By using different intentions they added different programming to the water. The water is said to have relaxing and healing properties. Torsion waves allow for information transfer across the universe, connecting every atom with every other atom and since torsion waves travel at super luminous speeds they could be the explanation of the non-local effects that were predicted in theory and empirically discovered in quantum physics. The information field created by torsion waves allows for a coherent whole of the universe, connecting every little atom with all other matter in the universe, informing it of its whereabouts and activity. In fact scientists are discovering a very high state of coherence in our physical universe that cannot easily be explained if the universe is a bunch of single individual parts of atoms, molecules, planets and stars that only maintain contact by separate forces such as gravity acting upon them. Quantum entangled particles keep their coherent relation eternally and are not bothered by any distance separating them whether it be a few millimeters or the distance of a galaxy. These coherent relations can only be explained if an invisible field permeates the universe that interconnects them.
. It’s this primordial information field that is the ground of our universe interconnecting everything with everything rendering our view of separate entities in this universe useless. In his system theory there are no separate entities at all; ‘separate’ entities that we observe in our universe are all embedded in one seamless interwoven net of connections. The author of this book personally testifies that psychic gifted people are able to read the Akashic records. In the past I have been consulting a paranormal practitioner for a long time. Being born as a very skeptical person, my disbelief in the paranormal however eventually melted as I was confronted with many unusual cures that I could not explain. I also shared many experiences with other clients of this practitioner during the long waiting hours in the waiting room. During one of my consultations I handed him a photograph of someone close to me without disclosing any prior details about the person in the picture, not a single word. I simply asked if he could help this person. He held his hand above the picture to sense it while he started to reveal to me what had happened to this person in clear details and quiet explicitly explained the situation this person was in. The information hit me right in the face for I knew he was right. I was totally flabbergasted by the experience since there was no way he could know the details he was revealing to me! From this moment on I knew with absolute certainty that there was something fundamentally missing in my understanding of what I believed to be my materialistic reality. To me this personal experience changed my skepticism about the paranormal once and for good. After my first experience I met and talked to several people with paranormal abilities. I can therefore from my own experience testify that psychic abilities to read the Akashic records are real and that indeed everything that has every happened in this world must be written in the vacuum fabric of space and time. Human consciousness is able to read this book of life. Read the articles to find out more about intuition. Owners of a dog know that their dogs are often mysteriously able to sense their bosses return home after a long day at the office. Animals in nature are able to sense a pending Earthquake. Hours preceding the actual quake animals start to respond very nervously as if they sense something terrible is about the happen. Earthquakes are accompanied by a tremendous release of torsion waves as a result of the frictions that occur in the Earth crust prior to the quake itself. These intensified torsion waves are most likely sensed by the animals’ consciousness and may explain their nervous behavior in anticipation of the quakes. Humanity has somehow lost its paranormal abilities that are still common in animals. During the tragic events of the tsunami that took place on the 26th December 2004, rescue workers in the aftermath of the Earthquake were amazed to find an almost complete absence of dead wildlife although there were so many human casualties. The reason may be that animals used their 6th sense and felt the impending disaster that caused them to flee to safer places in the higher mountains. Russian scientists rediscovered Tesla’s new type of non-electromagnetic energy that travels in spiraling waves and called it torsion waves. Scientists now believe that torsion waves can be regarded as information carrying waves rather than energy waves. It was proven that torsion waves are linked to human consciousness and are created by human thought and emotions. Torsion waves are the interface between the mental and the physical world although we must keep in mind that in reality there is no duality between them. Kozyrev discovered that stars also radiate torsion wave energy and present a new theory about matter that agrees with Plato that the atoms are constructed from the Platonic solids. Some scientists now believe that the aether is a subtle energy that flows through all material things like some liquid, creating the material world from it. The Platonic solids are believed to be the geometrical internal structures of the atom. That’s the reason why sacred geometry is so important in this new aether theory. There is only one such thorus that fits all of the above and is the holy grail science is looking for and is explained on truth & revelations.